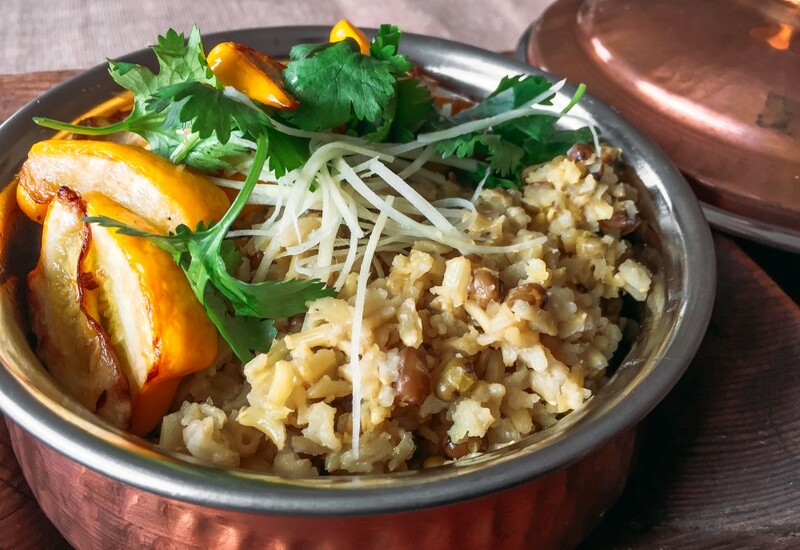 Kitchiri (or kitchari) is a combo of mung beans and basmati rice that's an Indian comfort food. It's thought to cleanse and cure what ails you, kind of like chicken soup in America. It's usually made with white basmati rice but this kitchiri recipe calls for brown. And there's a good dose of the anti-inflammatory ingredient turmeric. There are as many variations of this dish as there are cooks. Some like it on the wet side—similar to Chinese congee, while others like it dry. This one has yellow squash but no vegetable is a wrong choice here. Feel free to experiment with different water quantities for different variations on the same theme. Kitchiri is excellent with all sorts of sautéed vegetables. Try leafy greens, bell peppers, or eggplant. For even more plant-based protein, serve it with dal on the side. Per Serving: 228 calories; 11g fat; 29.4g carbohydrates; 6g protein; 16mg cholesterol; 7mg sodium. This was very authentic tasting kitchiri. It's very filling and hearty, especially for a vegan dish. I also added bell peppers in addition to squash, and found all of the flavors to be very good together. Mung beans are definitely underrated, but I think they're becoming more and more popular. I liked them in this dish, in addition to the squash and cumin seeds, which I rarely have an opportunity to cook with. Lots of flavor, definitely worth making again.